A look at where you can find Wanted: Subterranean Mind in Destiny 2: Forsaken. In Destiny 2: Forsaken, Guardians have been curious to know where to find Wanted: Subterranean Mind. First, to unlock this Wanted Bounty, you’ll need to pay a visit to the Spider over at the Tangled Shore. There, you can exchange Ghost Fragments for Wanted Bounties, including Wanted: Subterranean Mind. With the Wanted: Subterranean Mind bounty unlocked, you’ll need to head out into the world of Destiny 2: Forsaken to track down your Wanted target. To help simplify the process, we’ve put together a quick guide on where to find Wanted: Subterranean Mind in Destiny 2: Forsaken! 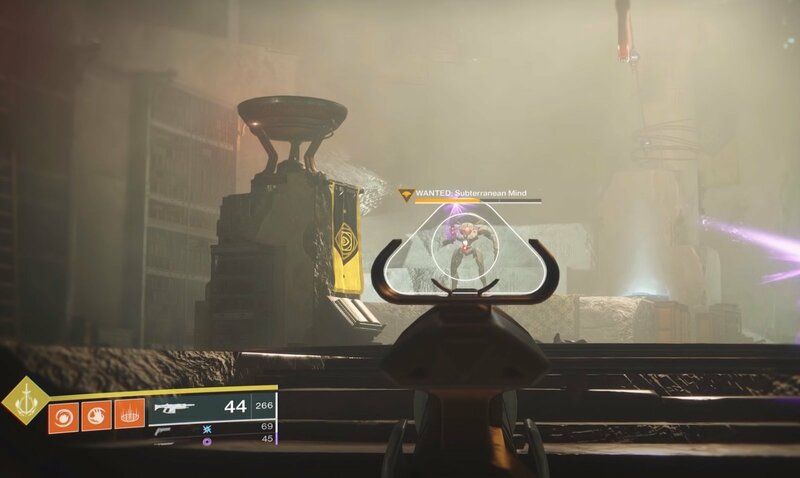 To find Wanted: Subterranean Mind in Destiny 2: Forsaken, you'll need to locate the Pariah's Refuge Lost Sector on Mercury. 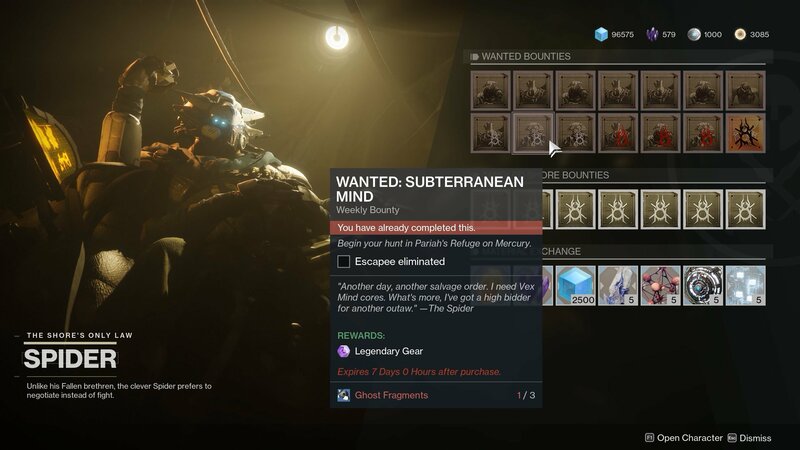 In Destiny 2: Forsaken, players have the ability to purchase Wanted Bounties from the Spider, including Wanted: Subterranean Mind. If you have a few extra Ghost Fragments on hand, head over to the Tangled Shore and interact with the Spider. There, you’ll be able to purchase the Wanted: Subterranean Mind bounty. Above the lore text, instructions can be found that indicate you’ll need to begin your search in Pariah’s Refuge on Mercury. To track down Wanted: Subterranean Mind, you’ll first need to head to Mercury and locate the Pariah’s Refuge Lost Sector. Note that this is the only Lost Sector in the area. Enter the Pariah's Refuge Lost Sector to find Wanted: Subterranean Mind in Destiny 2: Forsaken. To find it, face away from the Lighthouse and look for the entrance to Pariah’s Refuge towards the back left-hand corner near the Infinite Forest. Once you’ve found the Pariah’s Refuge Lost Sector, head inside and begin clearing out enemies. With the enemies cleared, you can begin fighting Wanted: Subterranean Mind. You’ll know this is your target as he has a large “WANTED” indicator, and his name is marked in yellow. After defeating Wanted: Subterranean Mind, return to the Spider to turn in your Wanted Bounty to receive your Legendary rewards. For a visual guide, be sure to check out the video on where to find Wanted: Subterranean Mind in Destiny 2: Forsaken courtesy of YouTuber 360GameTV (seen below). For more on Destiny 2: Forsaken, be sure to check out some of our previous guides including where to find Wanted: Nariks Reborn in Destiny 2: Forsaken, where to find Wanted: Mazan, Lost Captain in Destiny 2: Forsaken, and where to find Wanted: Student of Beltrik in Destiny 2: Forsaken. By reading through this guide, you should now know where to find Wanted: Subterranean Mind in Destiny 2: Forsaken.